Johnson is a businessman and former Governor of New Mexico. Johnson is known for for his classically liberal views while favoring small government. Before his campaign, he was the CEO of a marijuana-branding company called Cannabis Sativa Inc. He is the first unmarried candidate to run for president since 1884. Stein is a Harvard-educated medical doctor and activist from Massachusetts. Stein ran for president in 2012 and Governor of Massachusetts twice. As an environmental activist, her priorities are fixing climate change and eradicating student debt. She wants the nation's energy to be 100% renewable by 2030 and GMOs to be banned. She also wants to raise federal minimum wage to $15-per-hour. Castle is a lawyer and political activist from Memphis, Tennessee. Castle served as a marine during the Vietnam War and has been an attorney for over 30 years. In an interview, he called himself more libertarian than 2016 Libertarian Party Presidential Nominee Gary Johnson. His priorities are withdrawing the U.S. from NATO and ending the Federal Reserve. He is pro-life and opposes the war on drugs. He founded a Christian mission with his wife to help homeless children in Romania. 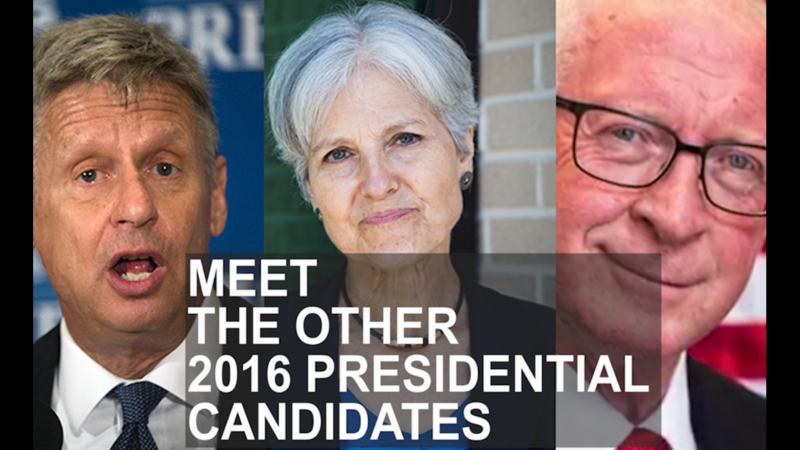 Is this the year the third-party candidate breaks through?